On an impulse, I decided to drop into the Los Angeles County Museum of Art in early January to tour its European galleries. Standing before the Gerrit van Honthorst painting “The Mocking of Christ,” I shuddered in painful recognition. Honthorst’s canvas conjured up for me those horrible photos, found ubiquitously on YouTube, of the cruel, sardonic mocking of prisoners at Abu Ghraib. The fundamental basics of dealing with prisoners (binding of limbs, confinement in space and dehumanizing rituals) have scarcely changed since Jesus’ time. Honthorst (1590-1656), a follower of Caravaggio, lived in Italy from 1610 to 1620. He was also known as “Gherardo della Notte” (Gerald of the Night) since he painted so many scenes set in that time of day. When he returned to Utrecht, Honthorst became a pillar of the Utrecht school of Northern Caravaggioists, who gloried in chiaroscuro. At that time, I had been closely reading and meditating on an arresting new book by Michael Kennedy, S.J., Jesus the Risen Prisoner: An Invitation to Freedom (Paulist Press). Since I decided to use it for Lenten prayer, I was seeking an apt artistic rendering of Christ the prisoner. Kennedy, who has worked closely with prisoners for many years, asks in his meditations on the passion of the prisoner that we linger on that unusual title for Jesus: “When have I ever heard of Jesus referred to as a prisoner?” As a long-time pastor of an East Los Angeles Hispanic parish, Kennedy has firsthand knowledge of young people who have gone to prison. In his book he describes their testimonies and those of their mothers, who agonize (as Mary surely did) about their sons, the prisoners. Then as now, prisons were rarely safe, salutary and sane places, even under the best of regimes. The scene depicted in Honthorst’s painting can be found in Mk 15:16-20. Actually there were two distinct mockings of Jesus. The first (cf. Mk 14:65-15:1) took place after the trial of Jesus by the Sanhedrin. The priest’s attendants covered Jesus’ face, struck him and, in a cruel variant of the child’s game blind-man’s bluff, said: “Prophesy for us. Who hit you?” The Roman abuse and mockery of Jesus pictured by Honthorst is the second account, which takes place after Pilate sentences Jesus to death. The soldiers ironically mock what Jesus truly is: the messiah king. Raymond Brown, S.S., in his magisterial commentary The Death of the Messiah, records several historical parallels in Jesus’ time of other condemned prisoners being dressed in royal robes, then stripped, spat upon, scourged and killed. In the Honthorst painting, the taunting guards look like ordinary twenty-something Dutch males today. The artist resisted demonizing the guards or making them brutish buffoons or grotesque caricatures, as Hieronymus Bosch does in his famous “Mocking of Christ” at the National Gallery in London. Rather than being, as such, especially sadistic, they were merely following the relatively routine cruel punishments of their day. 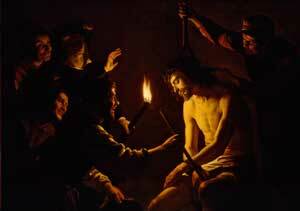 Honthorst also shows Christ as vulnerable. Some famous paintings of the mocking (for example, Anthony van Dyck’s at the Princeton Museum of Art) show Jesus seemingly unmoved in his inmost being by the mocking. But the very essence of being a prisoner is to be vulnerable and perhaps even to doubt, at times, one’s own very self. Stephen Barber, S.J., a Catholic chaplain at San Quentin prison, told me that the essence of being a prisoner consists in binding and confinement, the loss of freedom and mobility, being subject at almost all times to the commands of another. But Barber also challenged any simplistic devotional singling out of Jesus the prisoner. Prisoners lose their names and become mere numbers. Part of the humiliation Jesus must have felt was that he saw himself being treated (or mistreated) just like any other prisoner that night (as, for example, the two thieves eventually crucified beside him). In the way that many Christians reject capital punishment because Jesus was the victim of an unjust capital punishment, many also take to heart Jesus’ blessing of those who saw him in prison and visited him (Mt 25:36), recalling that Jesus was a prisoner. They heed the injunction of the Letter to the Hebrews: “Be mindful of prisoners, as if sharing their imprisonment.” In one sense, we all do share it. i enjoyed your article.The Catholic Church has been too silent on the issue of torture committed by the former administration. Thank you, Fr. Coleman, for a beautifully written and insightful article. I too was reminded of Jesus when I saw the images taken at Abu Ghraib. I was afraid I might have been alone in this. THANK YOU again! This article also appeared in print, under the headline "Jesus the Prisoner," in the March 30, 2009 issue. John Coleman, S.J., is an associate pastor at St. Ignatius Church in San Francisco.